With its military dominance being hollowed out by China, the agreement over access to Australian bases makes sense to the U.S. But what about Canberra? 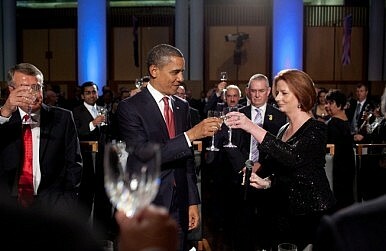 U.S. President Barack Obama’s sheen may have worn off somewhat in the United States, but not in Australia. Yet amid the handshaking and backslapping, the photo opportunities and exultations of shared values, interests and history, it’s easy to overlook the fact that Obama’s trip “down under” is driven by cold strategic logic: to sell Australians on accepting a greater burden on behalf of their alliance with the United States. That process has begun with a major enhancement of military cooperation between the two countries, to be concentrated in Australia’s North West. The arrangement grants the U.S. military greater access to Australian bases, particularly airfields, as well as providing for more extensive training, ship visits and exercises, and the forward deployment of a small detachment of U.S. Marines. It also covers the prepositioning of materiel – fuel, ammunition and spare parts – creating the foundations of a latent staging point for the U.S. military in the Indian Ocean. For many Australians, an enhanced U.S. presence in Australia is a beguiling prospect. Not only is it seen as a welcome symbol of Washington’s enduring strength and resolve, but also as a more tangible expression of U.S. strategic commitment. The reality is somewhat different. In fact, Washington’s sudden interest in Australian real estate says less about its resilience than its relative decline. In particular, the quest for new bases reflects the way in which China’s growing power has already begun hollowing out U.S. military dominance, pushing back the boundaries of U.S. primacy. Indeed, while the United States has spent the past decade losing wars and squandering power, China has been studiously undercutting U.S. advantages across virtually every sphere of policy: economic, diplomatic and strategic. No longer the quiescent child it was when the United States took its eye off the ball, China has grown into a boisterous teenager – and has plenty of growing still to do. With the transformation of Asia’s security order well underway, Washington now finds itself trying to reinvigorate its strategic presence in the face of a putative rival over whom its leverage has been greatly diminished. Still, why the specific interest in Australia? Three reasons predominate. The first reason is largely technical: over the past two decades, China has accumulated a formidable array of precision guided strike capabilities, namely long-range ballistic and cruise missiles, which can be launched from sea, air and land. These have been woven into an offensive war-fighting doctrine that places an operational premium on their use early and en-masse – and not just against U.S. ships at sea. Since U.S. bases in Japan, Korea and even Guam are increasingly at risk of being saturated by Chinese missiles at the outset of a conflict, they no longer constitute an indefinitely reliable basis from which the United States can project power. Why Pick a Fight With China? China faces numerous challenges if it wants to maintain its rise. The U.S. should stop acting as if tensions – or worse – are inevitable.